Bad Tempered Zombie: How long does it take to eat a papaya anyway? I've been working on this thing for close to a week now. 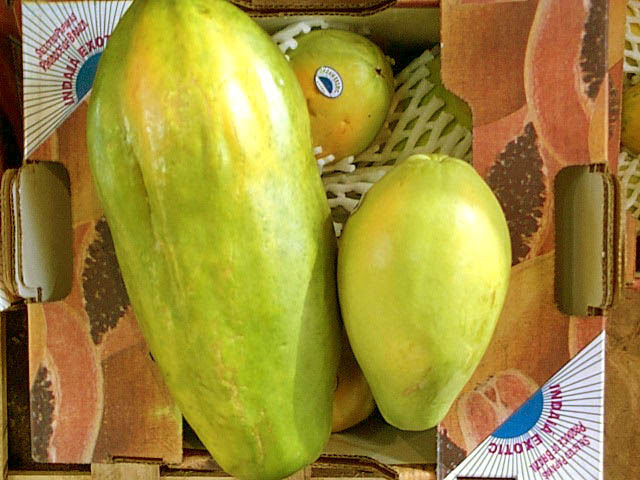 I like papayas (don't love them, like them) but nobody else in the family cares for them, so I hardly ever buy them. The thought of eating one of those behemoths by myself is too daunting. So if I do buy them, I usually only buy a half one, which are always priced way higher than the whole ones. But last weekend they had whole ones on sale for a really good price and there was one relatively small one that I grabbed, which was roughly only the size of a football, instead of a small car. The first bowl was very tasty, the second bowl pretty damn good, the third bowl quite nice, the fourth bowl not bad. But I'm starting to get mighty tired of choking down a bowl of papaya every damn morning. I want my grapefruit back! Or even a banana. I'm starting to understand what Jerry's mom meant when she would declare at every turkey dinner she hosted: "everybody take-it some white meat, or I be eating white meat all week long!" It's like buying food at Cost-co! We bought sliced Mangoes in bulk, and I never did get to finishing them. I usually just stick with my grapefruit. You can cut it and half, put it in the fridge, eat it later. They're bigger than oranges, they're easy to cut and they taste nice. At the moment I can't recall what a papaya tastes like. I think its all the cheese I just eat. I do love mangoes, but find they really are a hit or miss fruit, and try to buy small ones if I do feel like them. Whereas, typically grapefruit remains steadfast. Hmmm, grapefruit. Love it. However, dislike grapefruit juice (mainly in large doses). Hilary, do not even get me started on Costco! That place is dead to me. I can't justify spending $300.0 on food and tampons and such and still having to go grocery shopping on the way home. What do you do with 5 lbs of broccoli florets anyway? But bring on the grapefruit and I'm good. Papaya tastes just like cheese, but different, Allison. Mangoes can be so sneaky! Many is the time that I have cut into the most lucious looking soft red mango and it's a hard white potato inside. Brutal. But yes, you are so right - nothing is as stalwart as a trusty grapefruit. Papaya and some weird reddish fruit that has some weird name like permiseon are the only two fruits that I know of that I refuse to eat. Everything else is wonderful. Mangoes, grapefruit, bananas, cherries, apples, nectarines... you get the idea. Absolutely divine. Mmm Papaya! I love it! I wonder if you could cut it into cubes and freeze it for a while? There are different varieties right? I remember seeing smaller ones, but I think they probably taste a bit different. I love mangoes too, they are one of my favorite foods. Damnit, now I am craving a fruit salad! Here's my question: WTF is a papaya? I like most fruit too, Toccata. Eww except for star fruit. That stuff is plain awful. I don't think I've ever had persimmon though, but you know what fruit baffles me? Pomegranite. You've never had papaya, Snay? It's a fleshy mild yellow-skinned tropical fruit. I think they traditionally hollow them out and make canoes out of them. Sitting down to eat a pomegranite is so much of an investment, it borders on frustrating. Plus the mess it makes. I agree, it is very much a baffling fruit. As is the coconut. When I was younger, and obsessed with Gilligan's Island, I made me Mom buy me a coconut assuring her I would love it. I did not. And making those coconut phones are harder than they look. I've never warmed up much to papayas, but have discovered a newfound appreciation for grapefruit, something I never much cared for in the past. I decided that I like peeling them like an orange better, rather than cutting them in half and eating them with a spoon. I know, Allison, approaching a pomegranite is akin to starting open heart surgery. I usually disembowel the whole thing at one time and keep the seeds in a bowl. I wish you could just buy the seeds. I love the idea of wee Allison trying to make a cocount phone! TV is corrupting the minds of our youth! I'm feasting on oranges presenty. Got a super batch at a local grocery. This is a perfect time for oranges, Leazwell. I can OD on them this time of year. Shame about the cold weather which will make them like gold in a week or so. I have the feeling my permiseon is a pomegranite. Silly me. I knew I didn't have the word right. People eat star fruit? I thought it was for decoration only. Pomegranite is the one where you only eat the seeds, Toccata. It's actually delicious, and the seeds are boffo in salads, but your kitchen looks like you were performing satanic rituals when you are done. Starfruits are best left as decorations. I ate an entire pomegranite last night! I got juice pretty much everywhere, it looked a bit like a murderscene. But it was very delicious. There was a hole in the seed and it made arterial wound patterns on my Mathfocus 10 textbook. My mum makes it in a salad with pine nuts and it's very awesome. It would be lovely with pine nuts, Hilary. You guys have the best salads by the sounds of it. It's only fitting that your math book looked like it was rescued from a crime scene - that's sort of the way I have always felt about math, anyway. This is something I struggle with constantly. If I actually make myself a dinner I have to commit to at least three days of the same meal and possibly a lunch. Eating alone is awful boring. No grapefruit juice for Allison huh, or at least not in large dose,LOL! I love grapefruit juice, one relatively normal sized glass every morning. Absolutely agree about Pomegranite. Terrible nasty trickery to get into that bugger, and yes very much like a coconut that way! Pomegranite has been attempted once, NEVER again...maybe the juice (premade)especially in a martini. If I had to eat alone I'm pretty certain I would have a boiled egg every night, Serah, so I do sympathize. I don't mind grapefruit juice, but perfer the whole fruit. I'd love to be able to buy pomegranite sees, but the juice would be killer too. I want one of those smoothies right now, Mel! I love the thought of Allison building a coconute phone too. Those guys on Gilligan's Island were pretty smart. It does keep well in the fridge. I like to eat half a small one for breakfast. The trick is definantly proper ripeness and white sand beach. I saw a small one for the frist time yesterday, Just A, but I think I will wait a while before I buy some more - papaya overload. I'm certainly a grapefruit man myself. My experience with Papaya is rather lacking. What, there were no dancing girls as part of your papaya experience, Will? You cannot beat a grapefruit for a consistently good fruit experience. There's a Brazilian steakhouse chain called "Texas de Brazil" which is a pricey gorge-fest with all the trappings and appointments of a decadent Roman Feast (with the exception of the vomitorium) and one of the desserts is a sort of creamy papaya drink at the end. And woe betide the hapless diner who partakes of the feast, has the papaya dessert coupled with a long drive home. It could get ugly.